NB: Please ensure you also read our About SSSS Tips page that provides more information about our results reporting and other unique factors. These selections are our major plays for the day. They come from multiple methods: combining a very high race-strike-rate method with three analysis services and then are further scrutinised using the methods of "Mr Pretium" and market information to leave only the best selections by three analysts. They are quite selective and we eliminate many races based on risk, lack of form depth, track condition, and other 'dodgy things' that only come with a lot of experience - so there's generally between one and a few races covered a day. NB: We provide these around midday or earlier - but we typically don't bet on a HEAVY 8 track, or when we do, we consider it carefully. So do be aware of downgrades, we can't predict the future always there. But will note that in results. You have more power to abandon a bet or reduce stake if the track isn't suitable. We show each race using RewardBet if there are multiple selections - as it is the best way to stake your selections. However you are free to mimic the outlays with other operators, if that is your thing. Certainly, this is easier for the WIN component of the bets, but rather labour intensive for exotics. We include a danger or a second bet to some races. This is better staking than taking a single selection each-way if there is a danger. You can back this to recover your stake on the main selection or you can take both in a RewardBet for maybe the main selection x 1.5 total stake, up to you. We generally take both selections in RewardBets as well. One Exacta with our main selection a banker for 1st for 0.15 UNIT. And a second QQ for 0.1 UNIT. 1. Of course any of those great overlays we get, you may miss out on. 2. We stake to profit 5 units. Easiest way to work that out is to take the price of the runner (eg: $5) and subtract 1 and divide that number into 5. So a $5 chance is an outlay of 1.25 units. Our maximum outlay is 2.5 UNITS. 3. If you are betting closer to the race, then as a price drifts, your outlay will reduce but your profit will remain the same! So you lose less but win the same. Eg: $5 drifts to $10. We suggested 1.25 units (as above) but now you only have to stake (5 / 9) 0.55 units. 4. Additionally, you *may* want to half your return when the horse drifts. So instead of betting to profit 5 units, you bet to profit 2.5 units. So for the above example, the outlay is now (2.5 / 9) or 0.28 unit. This strategy can help protect your bank. Many professionals put about 60% of the weight of their "thinking" into the market, as it is usually that accurate. Generally, on our RewardBet suggestions, our Reward Level will be for Bronze which provides proportional win selections and a small outlay on Quinella, Exacta and Trifecta (if applicable). However, depending on the Market Gauge there can be alternative Reward Levels suggested and varying outlay amounts. There will be either one, two or three main selections in a race or maybe more depending on the market gauge (and sometimes further selections for exotic positions). We try to clarify the staking for each race to help you understand our thinking and the proportioning of risk and return, the power of RewardBet. For single selection, we always seek value - which doesn't necessarily mean a big price of course. Remember, how you manage your bank and outlays across runners is the MOST important aspect of winning. Also after-the-race Analysis is very important, you need to learn to improve. We always provide our insights on how the race went to see what worked and didn't. Custom Reward Level - Quinella plus Trifecta. Custom Reward Level - Exacta plus Trifecta. We like this level when we have multiple runners that we've selected and the market gauge is quite high, meaning the exotics are the better way to bet. Custom Reward Level - Win Banker plus Exacta / Trifecta. This custom level is great when you have a standout for the win and you want to try and jag extra upside of Exacta Trifecta. 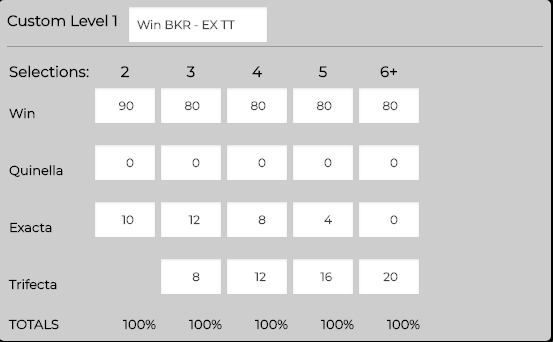 You can see that (except for only 2 selections), we always put 80% of our outlay on the WIN standout and 20% spread between Exacta and Trifecta, with the latter getting more percentage as we increase the number of runners - which is logical! Want To Turbo-Charge Your Betting? Find Out More.